Henrik Lundqvist (Swedish pronunciation: [ˈhɛnrɪk ˈlɵndkvɪst]; born 2 March 1982, in Åre, Sweden) is a Swedish ice hockey goaltender for the New York Rangers of the National Hockey League (NHL). He has been nominated for the Vezina Trophy three times. He finished third all three times. 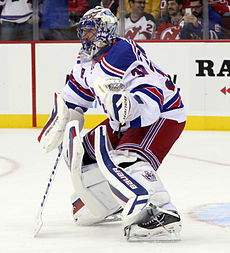 His play during his first season resulted in the New York media and Rangers fans giving him the nickname "King Henrik". During the 2006 Winter Olympics in Torino, Italy, he played on the Swedish team when they won their second Olympic Gold Medal. Wikimedia Commons has media related to Henrik Lundqvist. This page was last changed on 13 January 2016, at 11:46.